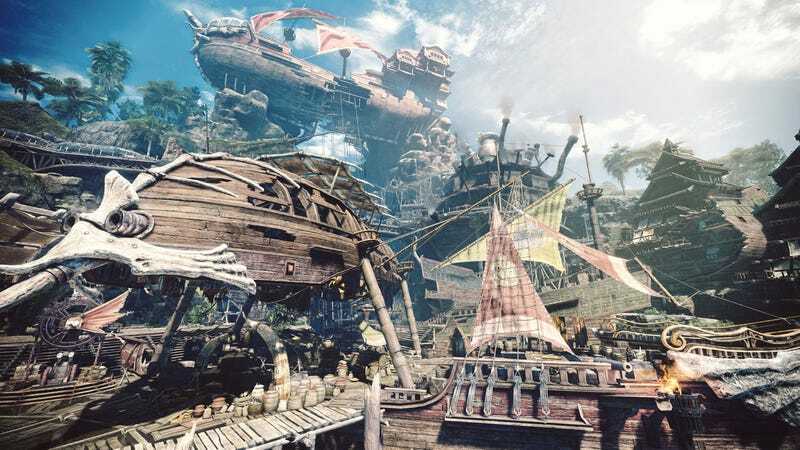 Monster Hunter World’s central hub is the hunting outpost of Astera, a massive base in the New World where players can gather to craft supplies and eat meals. The player returns here between every excursion into the wild. Astera is filled with merchants and characters that become a fixture of the player’s gameplay experience. Astera has four levels, each packed with various vendors and quest givers that the player returns to time and time again. As one’s familiarity with the space increases, a routine begins to set in. Head down to the tradeyard to buy potions before moving over to the garden to collect honey. Climb up the stairs and walk into the forge to check how many more Anjanath pelts are needed to craft a chest piece. Walk outside, sneak a peek at the quest board, and then slip to the canteen for a stat-bolstering meal. You stroll to the smithy much like walking to the subway in real life—purposefully, but while also shooting side glances to the guy who always sits on the stoop on the corner. Or, in this case, the cat that is always making soup in the canteen. In other cases, hub worlds become a space for interacting with other players. Dragon Ball FighterZ, like Dragon Ball Xenoverse before it, features an explorable hub where the player must speak to various characters who will organize online matches or send them into training mode. While this runs the risk of burying crucial options under a sea of NPC interaction, it also provides a sense of life as players run around, chat with each other, and show off their avatars. A less dynamic version of this hub world set up is found in games like Splatoon 2, where the player can see static versions of other players, inspect their loot, and read their messages. They provide a contrast to the competitive gameplay of online matches, showcasing colorful characters and connecting players to build a sense of community. Not all hub worlds need to be active places brimming with hustle and bustle. Dark Souls 2 features one of the best hubs in all of video games: the seaside village of Majula. It is a haven from the numerous bosses and monsters eager to smash the player into bloody bits. There is a kindness found in Majula’s sunset sky and twinkling chime soundtrack that is comforting. It is a place to rest and reflect where the player can pause to consider what to do next or, as if often the case, contemplate their failures and consider how to avoid them in the future. Dark Souls 2 is a game about a broken empire and the desperation that comes from living among the rubble. Majula is the last bulwark against the world’s decay, and a simple one at that. It’s not a grand fortress with high walls and patrolling guards. It is a few stray buildings buckling against the wind but still standing nevertheless. In a world defined by loss, it manages to inspire hope. If Majula can last, maybe the player can as well. They return from the monster filled wastes not just to upgrade gear and level up, but to truly and properly rest. The fact that these disparate hub worlds can achieve so many different things is inspiring. Monster Hunter World’s hub offers a sense of determination, a base where routine leads to a sense of security. Dragon Ball FighterZ and Splatoon 2 turn their spaces into bright city squares that complement their raucous gameplay. A space like Dark Souls 2's Majula provides a welcome pause between battles. All of this comes as a result of offering a simple space to walk around and explore. They’re not just online lobbies or markets—they’re home.